The long-awaited Android 5.1.1 (LMY47X) OTA update is now available for the Nexus 9 users and said it was rolling out that very day. If you are the Nexus 9 user then you will get this OTA update very soon. But as we all know the OTA roll out take some time and most of the user will get the update today and some of them after three or four days. If you can’t wait for such long time then you apply this update manually on your Nexus 9. The process is very simple and takes a few minutes to complete the task. All you have to do is, flash the Nexus 9 image on your device and you are done. 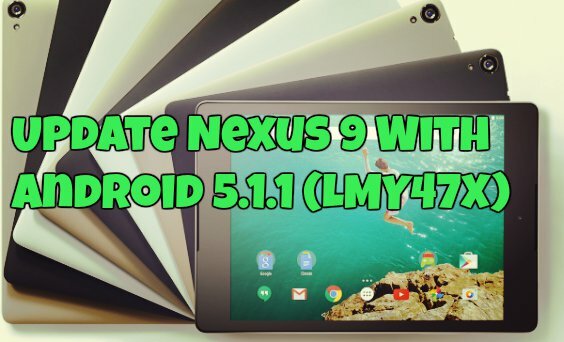 You can manually update Nexus 9 to Android 5.1.1 LMY47X factory image from the tutorial below. Before following this guide, do take the backup of you device and save it in some safe place and read all the instruction very carefully to update your device. Download Android 5.1.1 Factory Image for Nexus 9 from here save the zip file on your desktop. Now to get started you need a proper USB driver and ADB file to manually flash the images on your device. This tutorial is only for HTC Nexus 9 users and don’t try it on any of other devices. Here are the instructions on how to flash a Nexus 9 factory image.